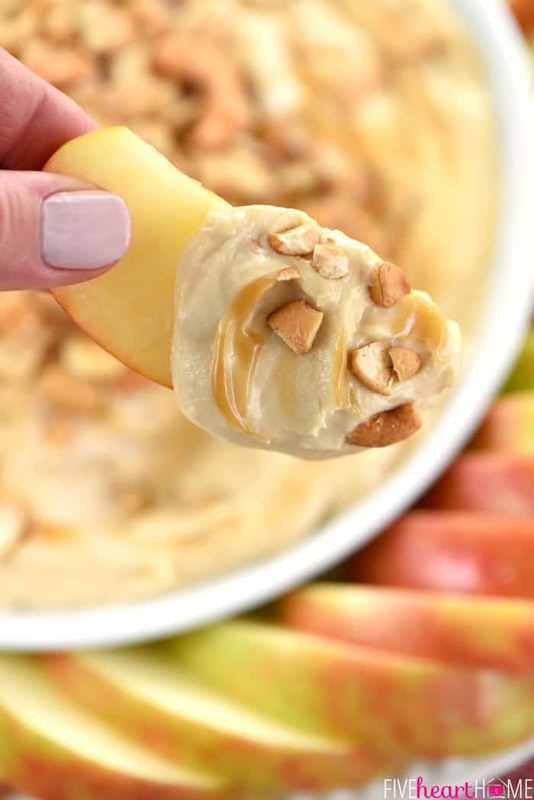 Sweet, creamy, 3-ingredient Caramel Apple Cheesecake Dip is a simple, scrumptious recipe for game day, Halloween parties, Thanksgiving dessert, and more! Who’s up for a quick and easy, minimal ingredient, sweet fall treat? 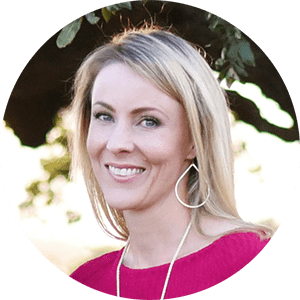 We’re talking three ingredients and just a few minutes here, people, for a tasty fruit dip that will get gobbled up in no time! 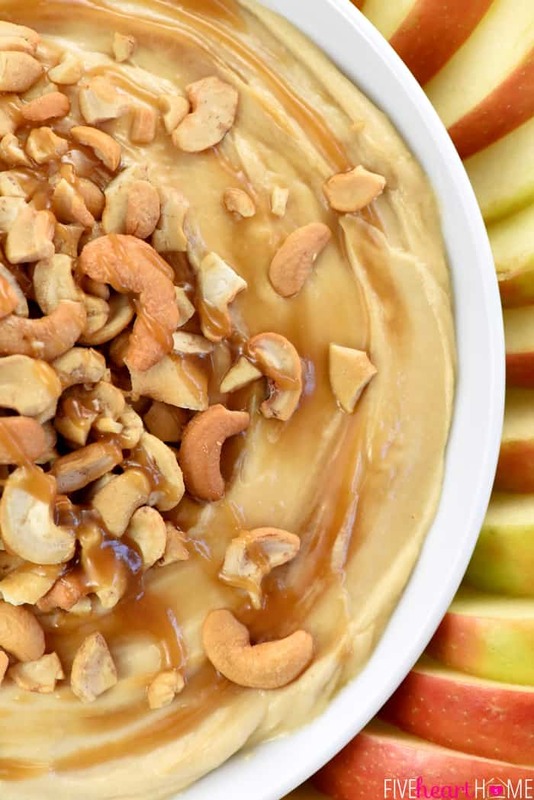 I’m telling you, Caramel Apple Cheesecake Dip is going to become your new BFF this fall. 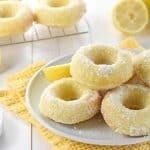 The next time you need to bring a treat to a party or gathering, this recipe has got you covered! 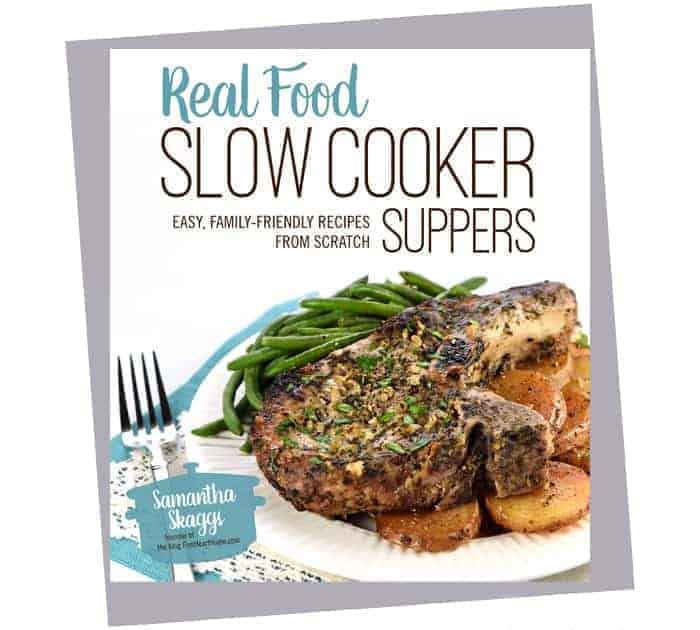 I don’t know about you, but life around here lately (AKA, for the last few years — ha) has been CRA-ZY, and sometimes a simple recipe like this truly saves the day. The day after I got back from my QVC trip a couple of weeks ago was my daughter’s birthday party with friends and family…and then the next day were the first flag football games of the season for both of my boys…and that was followed by my daughter’s actual birthday…and then a week jam-packed with the usual appointments and meetings, school obligations, and blog work. By end of the week, I felt like we’d all earned a relaxing family movie night, so I decided whip up this Caramel Apple Cheesecake Dip as a special dessert. 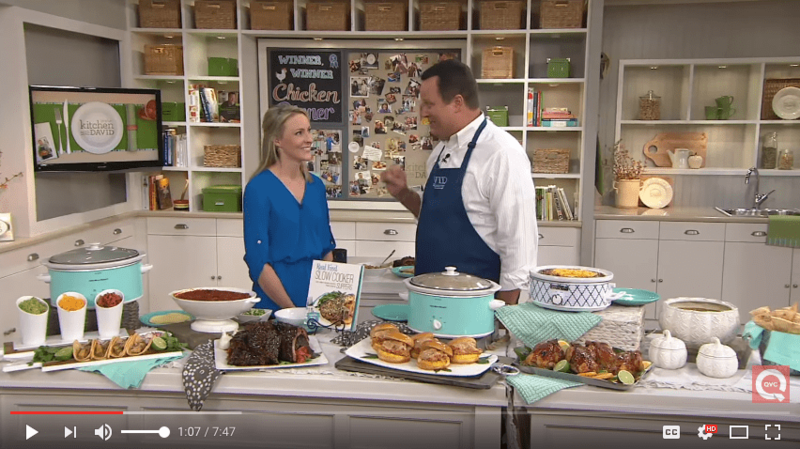 Nobody could believe how yummy it was…and y’all aren’t going to believe how easy it is to make! Three. Ingredients. Allow me to repeat that: THREE INGREDIENTS! And somehow, the combo of those three ingredients really does end up tasting like caramel apple cheesecake! Whip softened cream cheese until smooth and then blend in some caramel sauce. 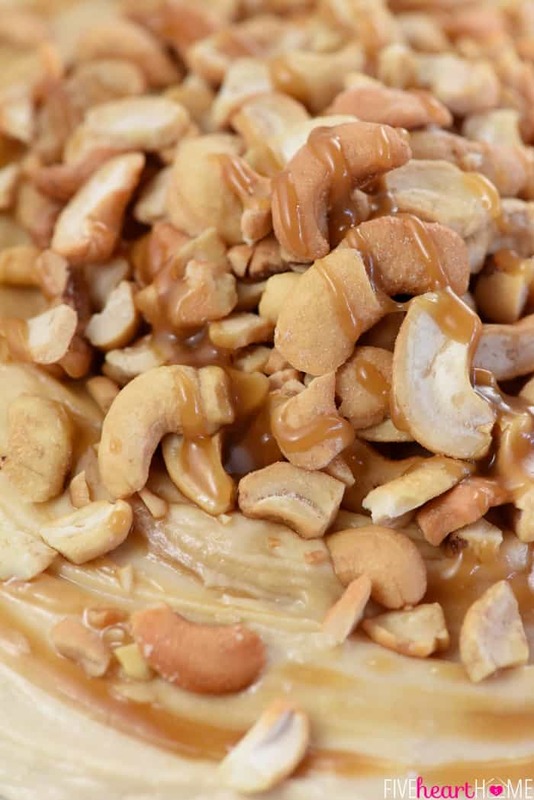 Transfer to a bowl and sprinkle with chopped salted cashews. That’s it! 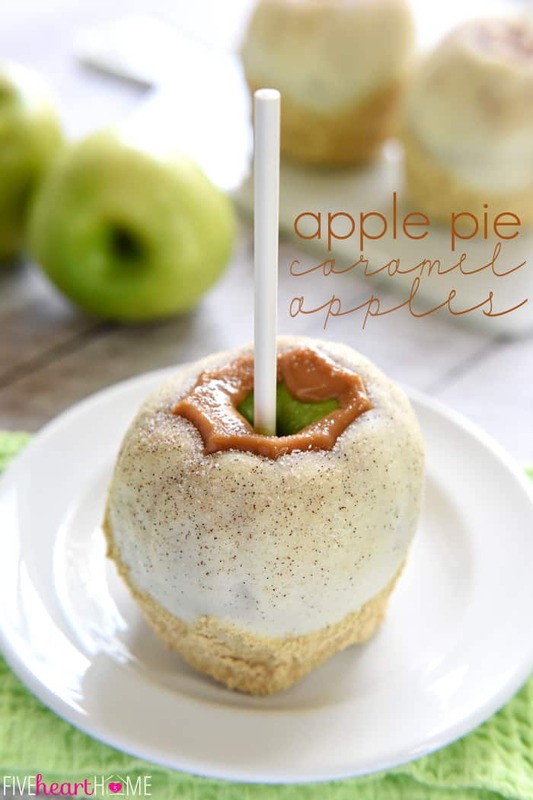 The apple part of the caramel apple cheesecake actually comes into play with the dippers. 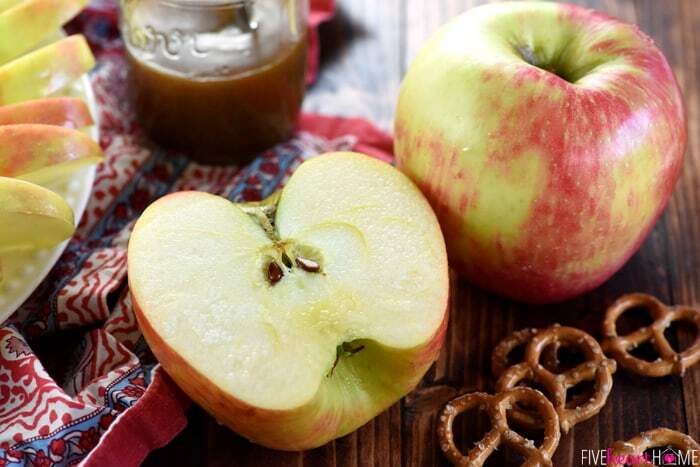 Simply toss thinly sliced apples with a little bit of lemon juice to keep them from turning brown. You can use your favorite type of crunchy apple, but I was excited to find Honey Crisps at the store for the first time this fall (hip hip HOORAY!). 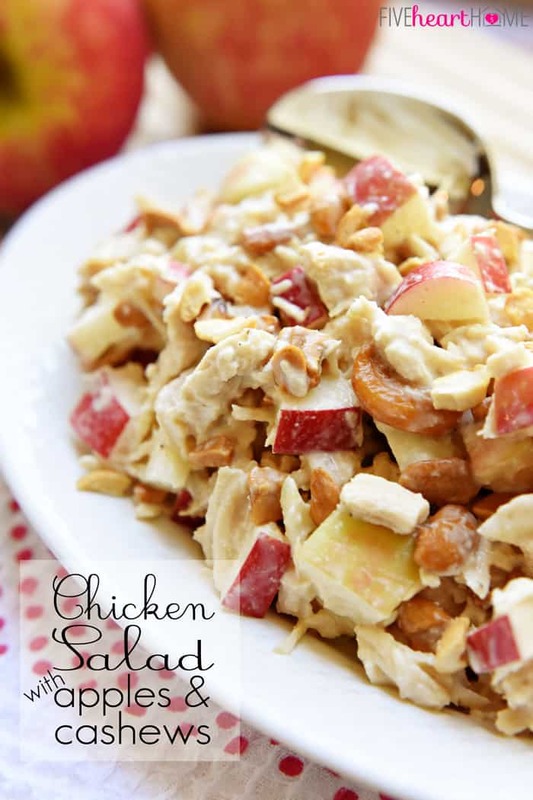 They’re my favorite type of apple in general, but they’re also particularly great in this application. Not only are they sweet-tart and perfectly crisp, but they don’t seem to brown as readily as other varieties of apples once sliced. Win, win! 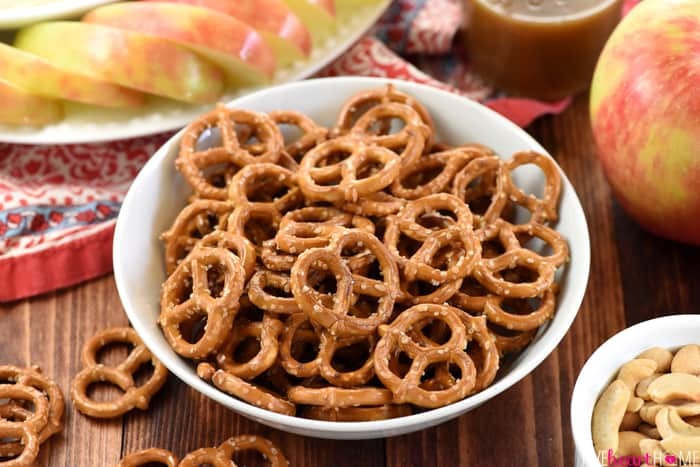 In addition to the apple slices, I decided to put out of bowl of pretzel twists for dipping, since everyone knows that salt + caramel are a match made in heaven. For that reason, be sure that the cashews you use are salted. And if you like, you could even sprinkle a pinch of additional sea salt over the top of the dip before serving. Now, let’s talk about the caramel. 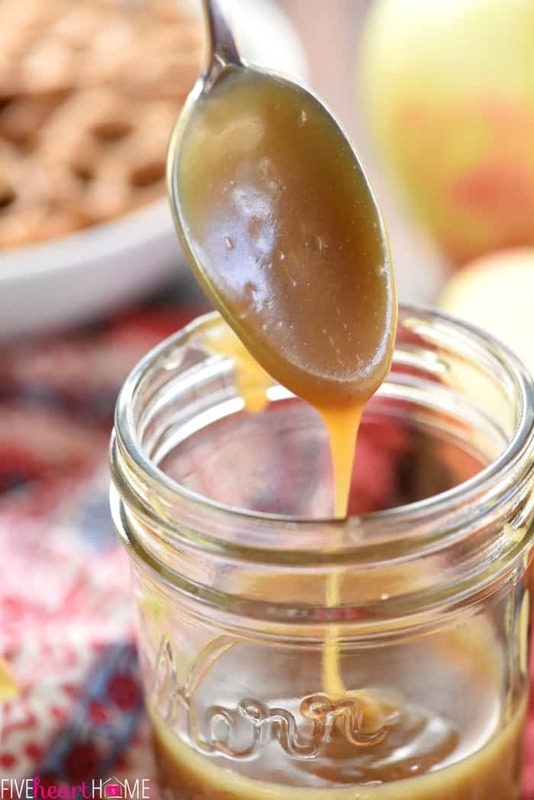 If you’ve never before made my 5-Minute, 5-Ingredient Homemade Caramel Sauce, it will change your life! Really. 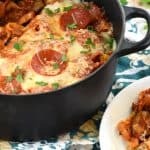 So simple and so delicious, plus you can actually pronounce all of the ingredients! 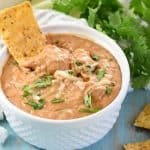 Because it’s so very easy (and because I hadn’t had an excuse to make it in awhile), I whipped up a batch the day before I planned on making this dip and popped it in the fridge. Then a few hours before I was ready to assemble my Caramel Apple Cheesecake Dip, I set out the cream cheese and the Homemade Caramel Sauce out to come to room temperature. After a few hours, they were ready to whip together for this dreamy dip. 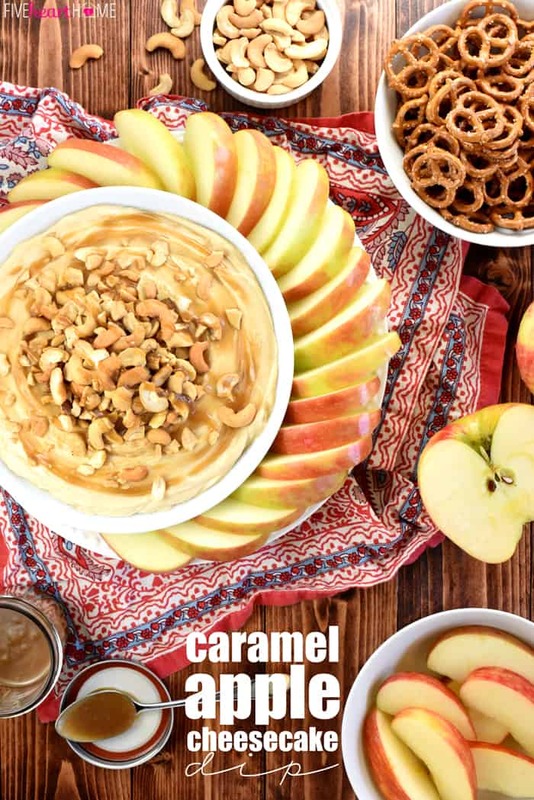 You're just three ingredients away from this sweet and creamy Caramel Apple Cheesecake Dip, a simple, scrumptious recipe for game day, Halloween parties, Thanksgiving dessert, or just about any special occasion or get-together! Use an electric mixer to beat cream cheese until creamy. Blend in 1 1/4 cups caramel sauce. Taste and add an additional 1/4 cup caramel sauce if you'd prefer the dip a little sweeter. Spread the mixture into a bowl. 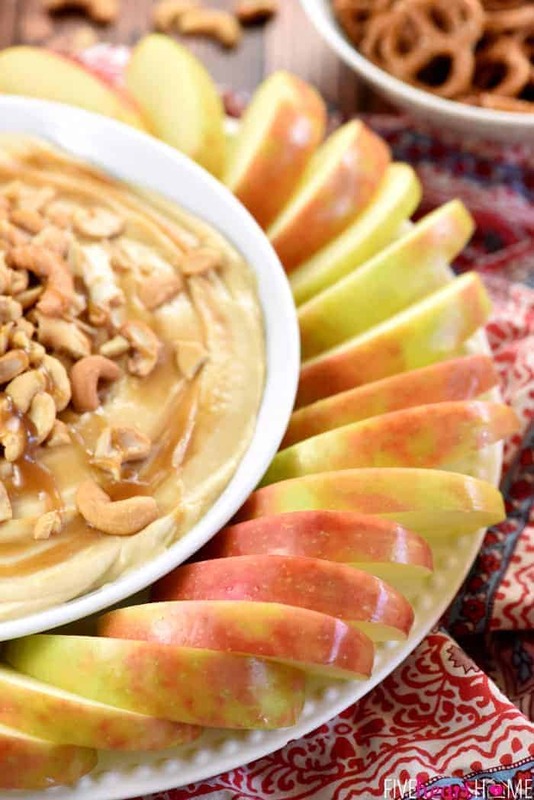 Top with chopped cashews (if they won't all fit initially, you may add remaining nuts to the top of the dip once some of it has been eaten). Drizzle dip with some leftover caramel sauce and sprinkle with a pinch of sea salt, if desired. 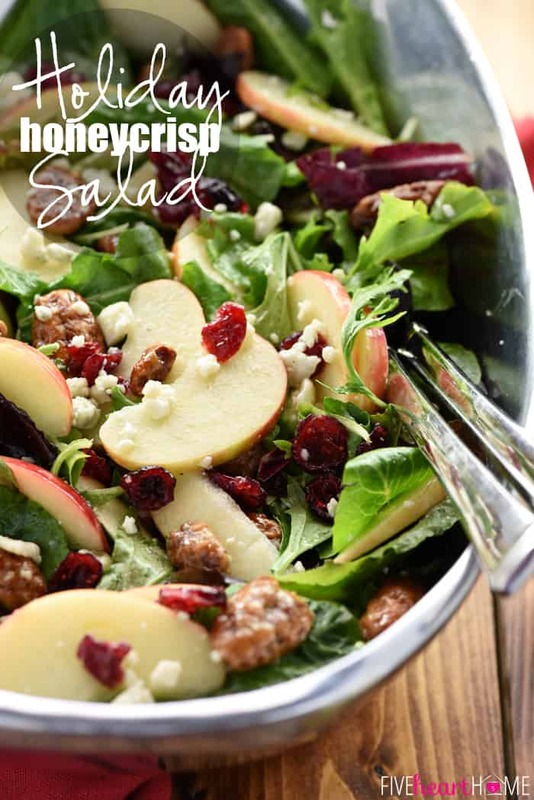 Serve immediately with apple slices and pretzel twists, and refrigerate any leftovers. Serving this dip in a wide, shallow bowl (as opposed to a narrow one) will provide more surface area on which to sprinkle the cashews. Depending on the size of the apples you use, you will probably need at least 4 large or 6 medium apples to have enough dippers (although I always like to keep a couple extra apples on hand, just in case the dippers run out). If you plan on making this with Homemade Caramel Sauce, the sauce needs to be at room temperature before proceeding with the recipe (if it's warm, it may melt the cream cheese). I recommend making the Homemade Caramel Sauce the day before and then refrigerating it, as directed. Then when you are ready to soften your cream cheese, set out the chilled Homemade Caramel Sauce at the same time to allow both ingredients to come to room temperature. This dip is best made just before serving so that it's soft and easy to dip. 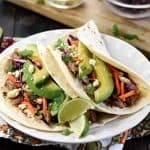 If you need to make it ahead of time, you may want to wait until just before serving to add the nuts, as they may become soggy in the fridge. Also, be sure to set out the dip a short time before serving so that it has a chance to soften and come to room temperature. 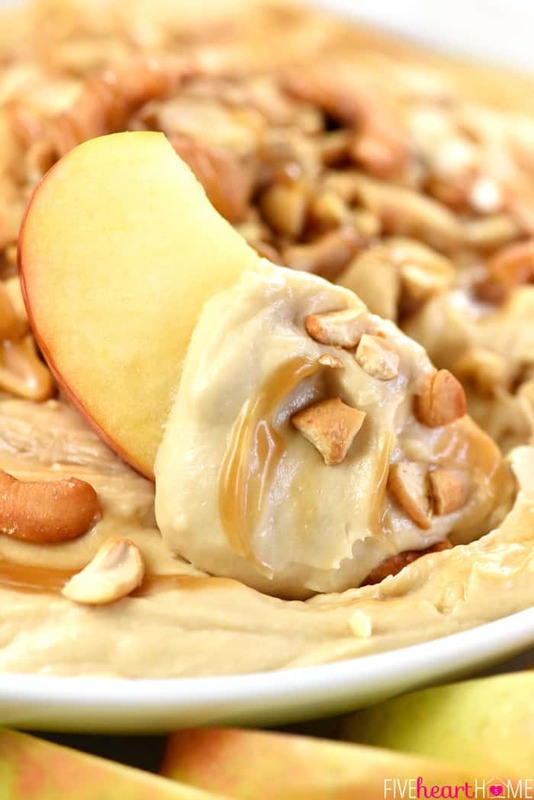 This dip looks pretty dangerous to me – especially with those cashews! 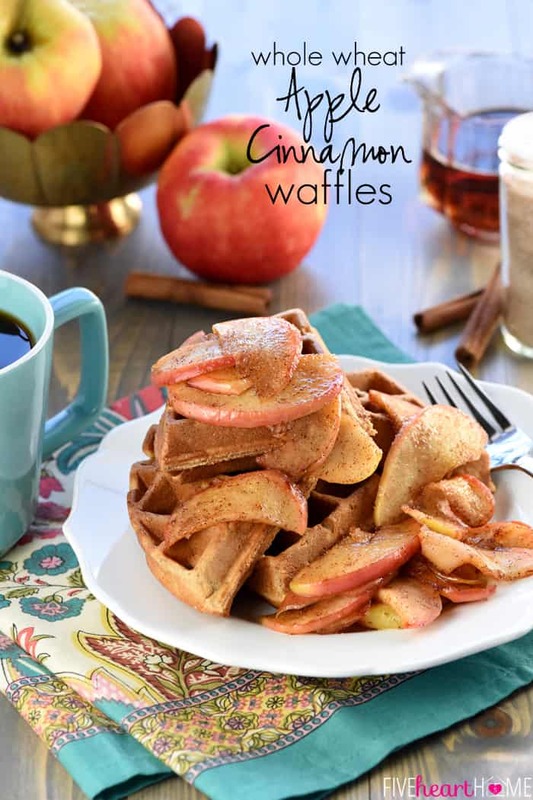 What a great easy fall treat!